Two new reports call that conclusion, straightforward as it may seem, into question. One examined how the other nutrients present in egg yolks can actually protect against coronary artery disease . The other is a meta-analysis of data gathered from seventeen discrete studies designed to determine if egg consumption is linked to a higher incidence of stroke or coronary heart disease . Both studies concluded that eating whole eggs (as opposed to egg whites) is not bad for your heart. In fact, it’s probably good for you. In 2012, researchers from Maria Luz Fernandez’ laboratory in the Department of Nutritional Sciences at the University of Connecticut demonstrated that eating three whole eggs per day, so 534mg of cholesterol, for twelve weeks increased HDL levels in people who were overweight or already showing signs of metabolic syndrome when compared to HDL levels in similar people who ate only egg whites . 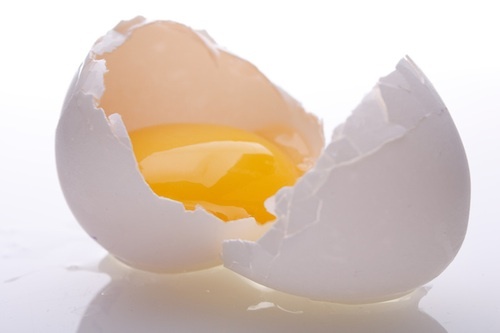 This three egg a day regimen was part of a high protein, low carbohydrate diet. HDLs, or high-density lipoproteins, are the particles that are responsible for cholesterol efflux: they clear cholesterol from your blood and bring it back to your liver. They are the ones known as “good cholesterol” since cholesterol efflux prevents atherosclerosis, the buildup of cholesterol and fat in the arteries. Because HDL particles are composed of cholesterol and various fatty acids, these researchers hypothesized that perhaps the particular fatty acids present in egg yolks gave whole eggs their ability to increase HDL levels. While the ratios of the different fatty acids did not differ significantly in the HDLs of the group that ate the whole eggs and the one that ate only egg whites, the people who ate the whole eggs had a 2.4% increase in cholesterol efflux over the egg white eaters. This may seem modest, but each percentage increase in cholesterol efflux has been found to reduce the risk of coronary artery disease by 30%. The specific fatty acids present in egg yolks are also known to promote anticoagulant activity, and may help prevent blood clots that way. Frank Hu, a Professor of Nutrition and Epidemiology at Harvard School of Public Health, oversaw a meta-analysis of seventeen studies undertaken over the last forty six and a half years that examined the effect of egg consumption on health . Nine studies focused on coronary heart disease, and eight focused on stroke. He and his group determined that the consumption of up to one whole egg per day was not associated with an increased risk of either heart disease or stroke. Interestingly, they also found that among diabetics egg consumption was associated with a 50% increase in heart disease risk, but a 25% decrease in stroke risk. They warn that this result needs to be confirmed with more detailed studies. They conclude that although diet is an important determinant of serum cholesterol, dietary cholesterol has only a modest impact on plasma concentrations of LDL cholesterol — low-density lipoprotein, the “bad cholesterol” that is a known risk factor for cardiovascular disease and stroke. Since eggs provide an inexpensive and low calorie source of many nutrients — proteins, minerals, vitamin D, and unsaturated fatty acids — they suggest that eating an overall well balanced diet, rather than simply cutting out eggs or egg yolks, is probably the best way to maintain heart and overall health. Know Your Fats. American Heart Association. Accessed 2013 May 28. Andersen et al. Egg Consumption Modulates HDL Lipid Composition and Increases the Cholesterol-Accepting Capacity of Serum in Metabolic Syndrome. Lipids. 2013 Mar 15. Rong et al. Egg consumption and risk of coronary heart disease and stroke: dose-response meta-analysis of prospective cohort studies. BMJ. 2013 Jan 7;346:e8539. doi: 10.1136/bmj.e8539. Blesso et al. Whole egg consumption improves lipoprotein profiles and insulin sensitivity to a greater extent than yolk-free egg substitute in individuals with metabolic syndrome. Metabolism. 2013 Mar;62(3):400-10. doi: 10.1016/j.metabol.2012.08.014. Epub 2012 Sep 27.